VICTORIA - Recycling has become a daily chore in most homes, but for Victoria residential designer Keith Dewey the process of reusing is integral to the homes he creates. Dewey lives in what's thought to be Canada's first shipping container building, Zigloo Domestique, with his wife and daughter. "When it came time for my wife and I to move out of the small suite we were living in and look for a new house we decided to purchase a piece of property and prove some of these ideas I'd been playing with," said Dewey. The couple bought an awkward lot in downtown Victoria with a buildable footprint of 13 metres by 12 metres (42 feet by 40 feet), and Dewey was able to create a home with a living space of 186 square metres (2,000 square feet). "I used eight 20-foot (six-metre) shipping containers and modified them to include doors and windows. We also put a proper roof over them and created a very comfortable interior style," he said. The inspiration for designing homes with shipping containers came while Dewey was completing an environmental design program at the Ontario College of Art and Design. "The first example I ever saw was in a magazine article. It was a small 20-foot container converted into what was called the Future Shack," he said. "It was a container that could be deployed for emergency housing, opened up and made livable within 24 hours. "I thought that was a really creative solution to quick accommodation." Inspired by the Future Shack and suggestions from friends and family, Dewey began developing plans for Zigloo Domestique. 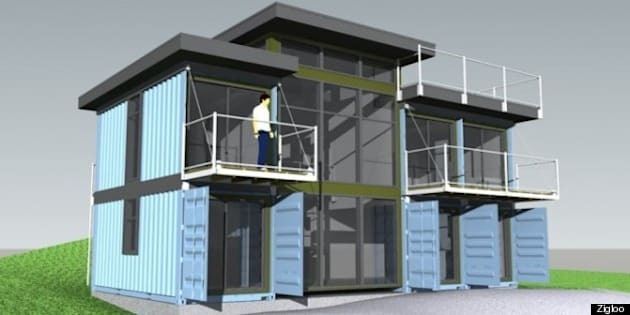 Now Zigloo is working on plans for residential spaces from Chicago to Devon, Alta., southeast of Edmonton, where a project using 2,000 shipping containers to build a high-density condo community is in the works. Even though shipping containers are strong when used for their intended application, Evan Willoughby, co-founder of Saskatoon's 3Twenty Solutions, said they become weaker when you cut the walls. "Doorways and windows are fine," said Willoughby. "But I'm working on a window that has a 16-foot (five-metre) opening in the middle to make a large room. We have to do a lot of welding reinforcing on the roof and floor." Willoughby and partner Bryan McCrea met while promoting former "Dragon's Den" entrepreneur Brett Wilson's Idea Q Challenge. "I've always been fascinated with modular construction and always thought I wanted to get into that," said Willoughby. "I was thinking how can I do modular and take it further." The pair ended up winning the challenge and eventually struck a deal with Wilson on the CBC-TV show. With the goal of eventually building residential spaces, 3Twenty Solutions creates onsite work and housing facilities, including a 180-person barracks at Canadian Forces Base Cold Lake in Alberta for Operation Maple Flag. Even though the containers need modifications to make them livable, Dewey said the environmental impact of using "end of life" containers is important. "Every year there are at least 1.4 million shipping containers sent back to Asia to be recycled," he said. "That's a very large carbon footprint when the structure is intact and you're able to do a little bit of manipulation, put them on a foundation and give them a new life. "It's a great retirement for them."